2019 AFP Recruitment Quota - Exam News, Reviewer, Military Career, & Everything [MN] . . 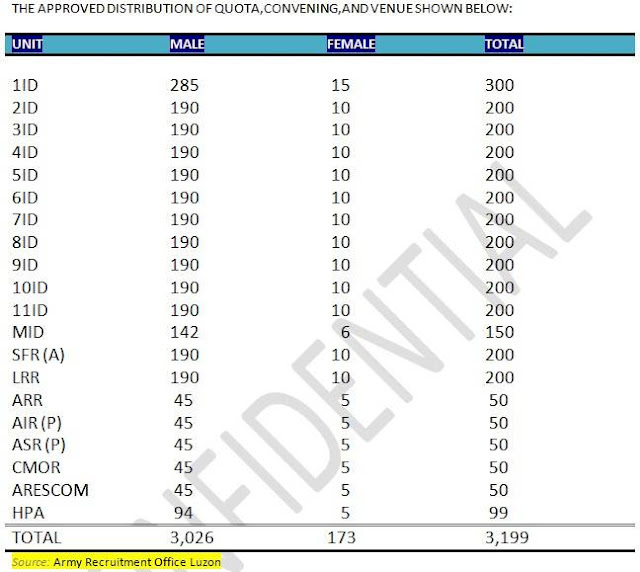 The Philippine Army has announced the approved allocation quota for CY 2019 as posted today, January 18, 2019, at Army Recruitment Office-Mindanao Branch FB page. Interested and qualified individuals who are planning to register are advised to prepare all the necessary requirement and be ready for the Physical Fitness Test for Candidate Soldiers Course. (H) PHYSICALLY AND MENTALLY FIT FOR MILITARY TRAINING.